Foie gras, which is French for “fatty liver,” is the diseased and enlarged liver of a duck or goose, produced through force-feeding. If producing foie gras doesn’t cross the line between harsh conditions and outright cruelty, we don’t know what does. Fortunately, now the public is finally taking a stand against it and a legal ban against foie gras has just gone into effect in California. Here’s just a bare outline of some of the almost too gruesome details of foie gras production. Each day for several weeks, a pipe is shoved down the birds’ throats to force-feed them. As a result, the birds’ livers, diseased with hepatic lipidosis, grow up to 10 times their normal size. The livers are then sold as foie gras. Force-feeding causes a number of injuries: bruising or perforation of the esophagus; hemorrhaging and inflammation of the neck resulting from the repeated insertion of the pipe into the throat; and asphyxia caused by food improperly forced into the trachea. Wounds of the esophagus may subsequently become infected. Force-feeding also results in numerous illnesses and disease, including hepatic lipidosis, bacterial and fungal infections, malnourishment, and lameness. For these reasons, mortality rates for force-feed ducks are 10 to 20 times higher than those for non-force fed ducks. If you find such conditions disturbing you’re not alone. According to a 2004 Zogby poll 77 percent of U.S.adults believe the process of force-feeding ducks or geese to produce foie gras should be banned. 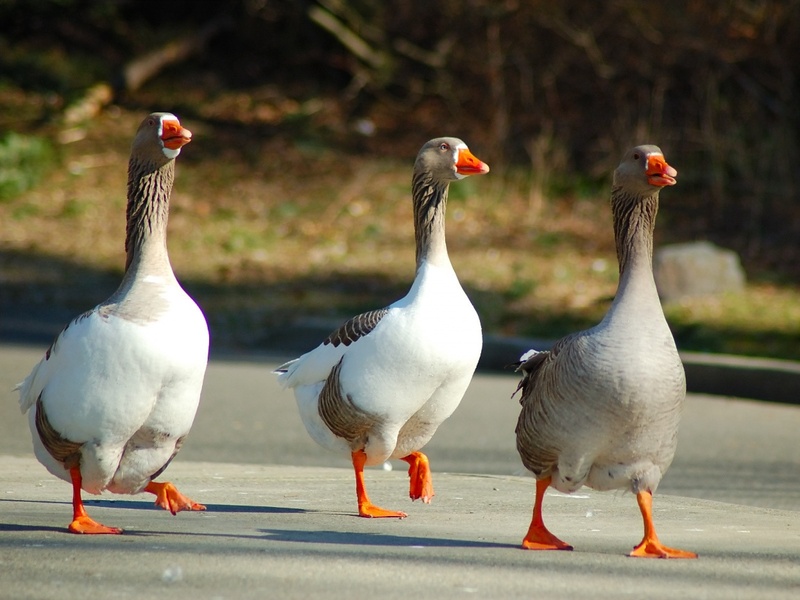 Behavioral evidence suggests ducks and geese experience fear, as well as acute and chronic stress from the multiple daily force-feedings and the pain associated with them. Nationally, several restaurants and retailers—such as Costco, Safeway, Target, Giant Eagle, PCC Natural Markets, Whole Foods Market, and Wolfgang Puck—refuse to sell foie gras. Internationally, due to the animal cruelty involved, more than a dozen countries—including the United Kingdom, Denmark, Finland, Germany, Israel (formerly the world’s fourth-largest foie gras producer), Norway, Poland, Sweden, Switzerland, and Argentina—have either outright prohibited force-feeding for foie gras production, or have interpreted it as illegal under existing anti-cruelty laws. Congratulations to the Humane Society of the United States, Farm Sanctuary, and a host of other animal rights and welfare groups for helping to get the new Californian law passed and the ban put into effect.